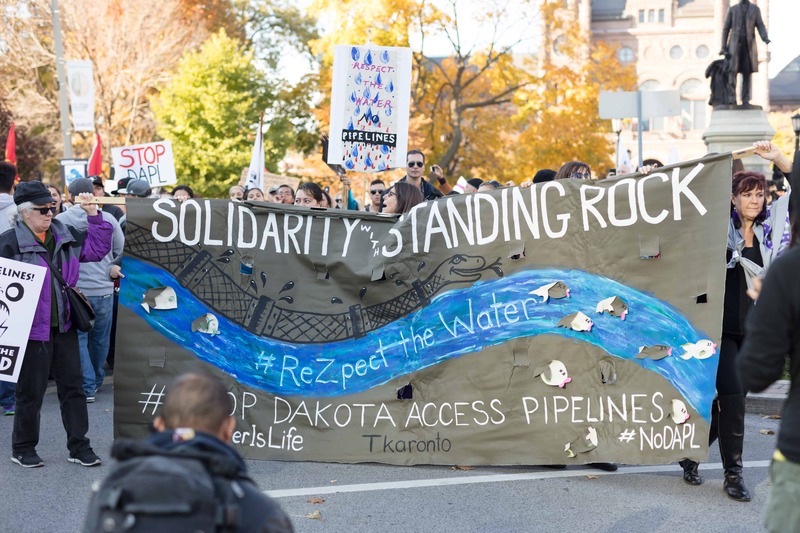 On November 5, thousands gathered at Queen’s Park to rally support for Indigenous peoples in the Standing Rock Indian Reservation, located between North Dakota and South Dakota in the United States. Members of the Standing Rock Sioux nation describe themselves as “Land and Water Protectors” and have been protesting the construction of the Dakota Access Pipeline for several months. Some of their specific concerns surround water conservation and safety, desecration of burial grounds, and environmental impact. The protests were met with significant resistance from both private contractors and the government, resulting in numerous instances of physical violence, intimidation, and arrest. The Standing Rock Sioux called for help across states and nations, asking for support of their cause and recognition of the occurring injustices. Toronto heard their cry: people came from both Indigenous and non-Indigenous communities to Queen’s Park, where speakers shared speeches and prayers of solidarity. Volunteers collected monetary donations, clothing, and toiletries to deliver to Standing Rock, as well as chemical goggles, masks, and flashlights for protection against violence. After numerous chants of “water is life,” Indigenous Elders led protestors towards the US Consulate General Toronto on University Avenue with the hope of attracting the attention of the American government to not only Standing Rock’s local support but also their international support. Despite some tense encounters with police at the consulate, the march continued its journey to Nathan Phillips Square where participants engaged in an act of solidarity by round dance. Groups sang traditional songs as the rally’s large drum thrummed. Throughout the entire march, strength and camaraderie permeated through the crowd. At the rally’s end, Torontonians showed support for the Standing Rock Sioux through not only songs and cheers but also direct support by monetary donations and gifts in kind.